Human Capital (2013), an adaptation of a novel by Stephen Amidon, was probably the most hyped film that I saw at this year’s MIFF. There definitely seemed to be a lot of people talking about the film leading up to it and an extra session was added such was the demand. The film incorporates an episodic structure, with all except the last being told from the point of view of a single character. This structure tells one story, however the perspective means that each episode gives more attention to different aspects. One focuses on the high finance dealings of a couple of players, one on an affair that now that I think about it has very little to do with the overall narrative and one on what is the main aspect of the story – a car accident and its impacts on the various characters. The final chapter of the film unfortunately falls apart quite badly in my mind. Narratively I think it takes some really unbelievable and clunky turns. There is an email conveniently found that I think is far too obvious in terms of storytelling. Following that there is an extortion scene that tonally just does not sit with most of what has come before. I am usually not a huge fan of POV/chapter type structures in this film, but I think it is probably the highlight of Human Capital. It allows intrigue to be created during one chapter and then answered during the next, and refreshes the film at regular intervals. One issue that it does bring about though is that the story feels a little slight, as it is a relatively short one being told multiple times. But it has great benefits to the film as well, especially when focusing on more interesting characters. The structure really situates you firmly in the world of the film, finding out information along with the characters and being shocked by various revelations just as they are. I would hesitate to promote Human Capital as a noir film, that most fluid of genres. It is more of invocation of noir tropes and iconography rather than a noir film in a plot sense. For me the lack of a femme fatale and the lack of a willing crime are two boxes the film does not tick. But much of what it tries to do comes from invoking and reinterpreting traditional noir tropes as well as keeping some of the generic iconography feeling like it came straight from the 40s. One of the main characters is an utter schmuck who gets himself into money trouble. There are affairs, forbidden loves, car crashes and gangsters of some form or another. Another way that the film attempts to update the traditional noir film is by including a high finance sub-plot, but I think this is less successful than the structure. There are laboured scenes of fatcats lounging about and high stakes meetings about finances. I also feel that the film invests quite a lot of time in this aspect of the film for only one very small outcome that could have been done a little more succinctly. The benefit of this is that it would have allowed more time to be spent on more interesting characters with more interesting dramas. It would have been a tauter experience if more time was spent on the central crime and the ramifications that it had on all the characters in the film. All that said though, the incorporation of this sub-plot does help to make the point toward the end of the film that in the end, the rich always sail through pretty comfortably. 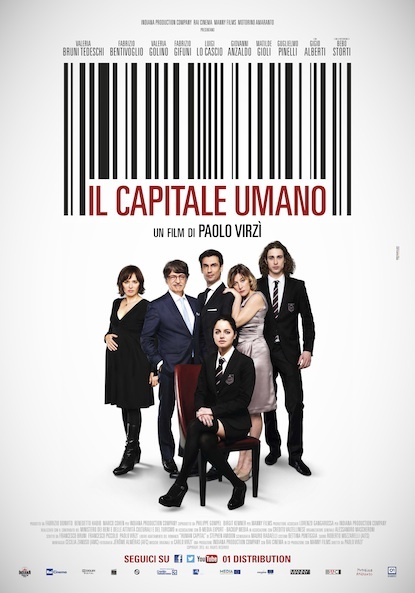 As a neo-crime noir hybrid Human Capital does many things in a really interesting way from the structure of the film to the nature of the crime at the centre of it. I do sort of feel that this review has come off more negative that I would have liked. I do have issues with the film but it is also relatively rare to see classical style cinema and storytelling updated in this way. Related beermovie.net articles for you to check out: MIFF: Jimmy’s Hall and MIFF 2014: When Animals Dream.